Maria Espinel is a Family Nurse Practitioner, Board Certified by the American Academy Nurse Credentialing Center (ANCC), and licensed by the State of Florida. Maria began her career in health care as a Licensed Practical Nurse (LPN) at the age of 17. Since then, she has accumulated nearly 12 years of experience and education in various areas of patient care. 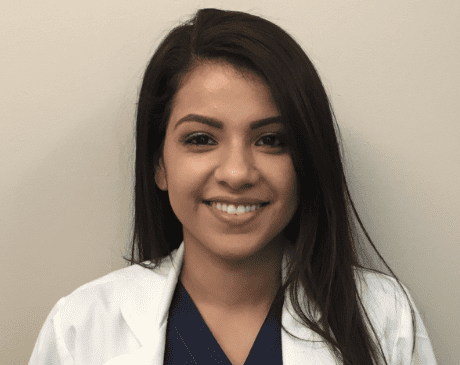 While working as an LPN, Maria pursued her interest in nursing, graduating with honors, from Florida Atlantic University with a Bachelor’s of Science in Nursing. Maria has always stated that knowledge is power and her desire for professional growth has remained relentless. While employed as a Registered Nurse at Broward Health Medical Center she attended Florida Atlantic University where she acquired a Master’s of Science in Nursing. Maria is passionate about building long-lasting and trusting relationships with patients. She seeks to acquire a comprehensive evaluation of every patient by taking the time to listen and understand patient’s needs. As of 2016, Maria partners with Dr. Wilson DuMornay at Broward ENT Services. She is involved in the entire continuum of care of Dr. DuMornay’s patients in the office, operating room, or hospital. Maria is an active member of several professional organizations including the American Association of Nurse Practitioners (AANP) and The Society of Physician Assistants in Otorhinolaryngology/Head & Neck surgery (SPAO-HNS). One of the primary goals of the practice is to provide quality cutting-edge therapies for our patient population. Our universal focus is on compassionate care and the development of non-surgical therapies and minimally invasive procedures when indicated. We provide a comprehensive ENT service, which includes Audiology, Balance testing and physical therapy, Voice disorders, Allergies, Sinusitis, Sleep Apnea, Head and Neck disorders, and In-Office CT imaging.